Weird War II seems to be an odd genre in and of itself. Something about the romance of the World at War, and then add in supernatural twists, bizarre equipment, Nazi Super Science, zombies, and daring deeds in an alternate history. It is a genre of fiction consisting of stories that are set in worlds in which history has diverged from the actual history of the world. In Marvel Comics, the universe known as Earth 597 is one where the Nazis won World War II. Many Weird War stories take place in this particular reality of the Marvel Universe. World War II had a significant impact on comics, as reflected in the war-themed subject matter of the time. Comic books, particularly superhero comics, gained immense popularity during the war as cheap, portable, easily read tales of good triumphing over evil. American comic book companies showcased their heroes battling the Axis Powers: covers featuring superheroes punching Nazi leader Adolf Hitler, such as Captain America #1 by Timely comics in 1941, or fighting buck-toothed caricatures of Japanese soldiers have become relics of the age. 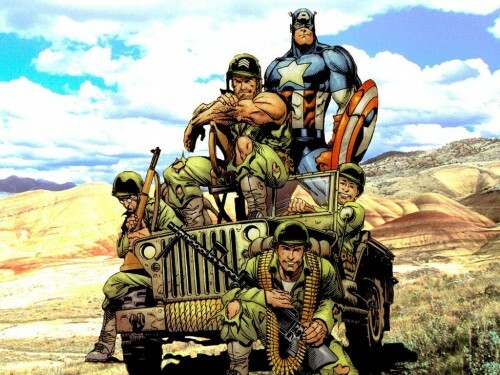 The Invaders team first appeared in flashback stories set during World War II, and comprised existing characters from Timely Comics, the 1940s predecessor of Marvel. 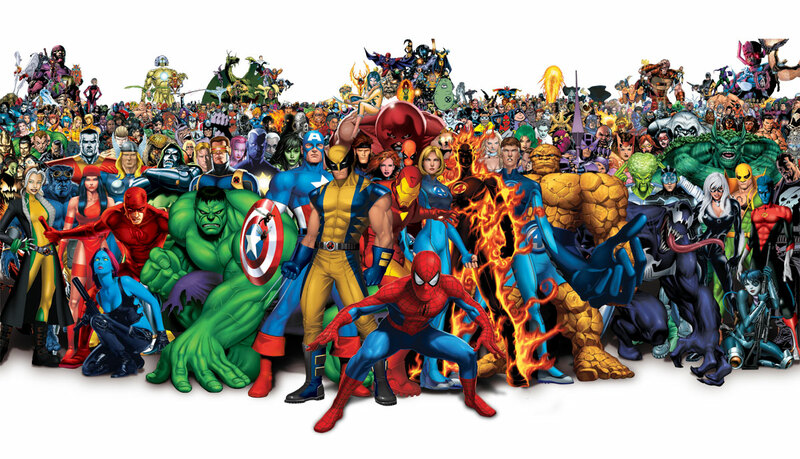 Originally, Captain America (Steve Rogers), his sidekick Bucky (James Barnes), the original android Human Torch (“Jim Hammond“), the Torch’s sidekick Toro (Thomas Raymond) and Namor the Sub-Mariner were together as heroes opposing the forces of Nazism. When these superheroes saved the life of British Prime Minister Winston Churchill from Master Man, the thankful Churchill suggested that they should become a team, known as the Invaders. The Invaders fought the Axis Powers over the world until eventually finding themselves in England, where they met Lord James Montgomery Falsworth, the original Union Jack. He joined the team and provided them with a base of operations in England. Eventually, Falsworth’s children Brian (Union Jack) and Jacqueline (Spitfire) became members. The team later added Miss America (Madeline Joyce) and super-speedster the Whizzer (Bob Frank), during a battle with the Super-Axis. Later, against the threat of the Battle-Axis, the team was assisted by the Blazing Skull and the Silver Scorpion. 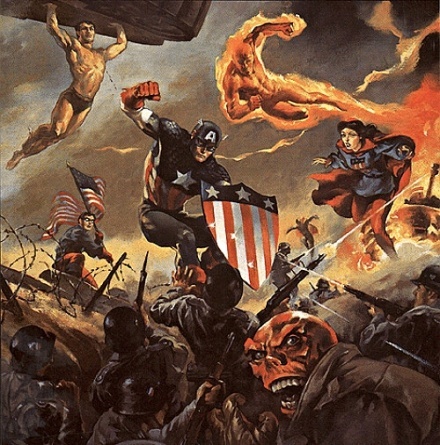 The team continued to fight against several threats, (including a Nazi occupation of Atlantis and the emergence of Hydra backed by a time traveling Baron Strucker) and faced an emotional trauma with the apparent deaths of Captain America and Bucky in a drone aircraft’s explosion near the end of World War II. After the war’s end, several members created a new team, the All-Winners Squad. When that team dissolved, Marvel reconnected several members, having them join Citizen V’s V-Battalion. Click here for posts about WEIRD WAR II. All This and World War II is a role-playing game adventure published by TSR, Inc. for the original Marvel Super Heroes role-playing game. It was the first of a three-part module where the player characters are intended to time-travel using an alien time machine. It was intended to be used before The Weird, Weird West and The Revenge of Kang. The player characters are contacted by Nick Fury to test a secret super-weapon. During the test, time-traveling Nazi commandos try to steal the weapon and take it to 1943, to add to the German war effort. The heroes must discover who this men are, and then they must go to the World War Two, to stop the Red Skull from using other futuristic weapons and change history. Wow, this looks so fun and interesting. Thanks for sharing. You’re welcome. What do you find the most interesting?